Cuban leader Fidel Castro has temporarily delegated power to his brother Raul after suffering intestinal bleeding which required surgery. 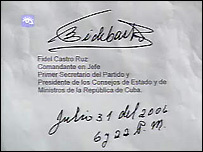 The proclamation on the handover - the text of which follows - was read out on Cuban TV by Castro's personal assistant Carlos Manuel Valenciaga on 1 August. As result of the great effort exerted to visit the Argentine city of Cordoba, to participate in the Mercosur meeting, the closing of the People's Summit in the historic University of Cordoba, and to visit Alta Gracia, the city where Che [Guevara] grew up, together with my participation in the commemoration in Granma and Holguin Provinces of the 53rd anniversary of the assaults on the Moncada and Carlos Manuel de Cespedes Garrisons on 26 July 1953, days and nights of nonstop work with hardly any sleep lead my health, which has withstood every test, to undergo extreme stress and a breakdown. This resulted in an acute intestinal crisis with persistent bleeding which forced me to undergo a complicated surgical procedure. All the details of this health incident are evidenced in the x-rays, endoscopies, and video record. The surgery makes it necessary for me to take several weeks of rest away from my duties and posts. I provisionally delegate my functions as first secretary of the Central Committee of the Communist Party of Cuba to its second secretary, comrade Raul Castro Ruz. I provisionally delegate my functions as commander in chief of the heroic Revolutionary Armed Forces to the aforementioned comrade, Army General Raul Castro. I provisionally delegate my functions as president of the Council of State and Government of the Republic of Cuba to the first vice president, comrade Raul Castro Ruz. I provisionally delegate my responsibilities as head of the national and international public health programme to the Politburo member and public health minister, comrade Jose Ramon Balaguer Cabrera. I provisionally delegate my responsibilities as head of the national and international education programme to comrades Jose Ramon Machado Ventura and Esteban Lazo Hernandez, members of the Politburo. I provisionally delegate my responsibilities as head of Cuba's national Energy Revolution programme and collaboration with other countries in this area to comrade Carlos Lage Davila, member of the Politburo and secretary of the Executive Committee of the Council of Ministers. The corresponding funds for these three programmes; health, education, and energy, should continue to be managed and administered, as I have personally done, by comrades Carlos Lage Davila, secretary of the Executive Committee of the Council of Ministers, Francisco Soberon Valdes, minister and president of the Central Bank of Cuba, and Felipe Perez Roque, minister of foreign relations, who worked with me in these duties and should form a commission to that end. Our glorious Communist Party, with the support of the mass organisations and all the people, has the mission of taking on the task given them in this proclamation. The summit of the Non-Aligned Countries, which will be held from 11-16 September, should receive the greatest attention of the Cuban nation and state and be held with the highest level of excellence on the planned date. I plead that the thousands of personalities who so generously planned to celebrate my 80th birthday this 13 August postpone the celebration until 2 December of this year, the 50th anniversary of the Granma landing. It is my request that the party's Central Committee and the National Assembly of the People's Government firmly support this proclamation. I have not the slightest doubt that our people and our Revolution will fight until the last drop of blood to defend these and other ideas and measures that may be necessary to safeguard this historic process. Imperialism will never be able to crush Cuba. The battle of ideas will continue. BBC Monitoring selects and translates news from radio, television, press, news agencies and the internet from 150 countries in more than 70 languages. It is based in Caversham, UK, and has several bureaux abroad. How will Havana respond to US moves to end Cuba's isolation?